Syncany takes security very seriously. Our goal is to protect the confidentiality of user data stored on remote servers – meaning that whatever leaves the local computer is encrypted. This chapter explains the security concepts of Syncany to the interested user in a hopefully understandable way. Due to the complexity of the subject, however, this is a rather technical chapter. If you just want to use Syncany, you can safely skip this chapter. Although we take special care designing and implementing the security-related parts of Syncany, we are not cryptographers. We have asked multiple parties to peer review our concept and implementation, and we hereby do that again: Please review our security concepts and implementation! If you believe that any of the concepts and/or the implementation is incorrect, insecure or can be attacked, please let us know by creating a new issue or by contacting us directly for major issues. Syncany’s central security goal is to protect the user’s data against attacks on confidentiality and integrity. Syncany provides data confidentiality and detects attacks on the integrity of data, but does not provide mechanisms to protect against attacks on the availability of data. Syncany assumes the storage provider and network infrastructure cannot be trusted. In contrast to that, Syncany assumes that the local machine is secure. Users sharing a repository trust each other completely. Pre-upload encryption: Before uploading anything to the offsite storage, Syncany encrypts files locally. This is done for metadata (database files) and for the actual data (multichunk files). The ciphers and modes as well as the resulting crypto file format is described in Encryption Scheme. Auth-only and HTTPS-only daemon/server: Accessing the daemon API or web interface is HTTPS-only using either self-signed or your own certificates; and allows only authenticated users. Details are described in HTTPS-only Daemon. For users to share a repository with Syncany, they must trust each other completely: They share the pre-shared repository password to access the Syncany repository and use the same credentials to the offsite storage. When a user creates a new repository using sy init, Syncany asks the user for the repository password. This password is used to derive a 512-bit master key using PBKDF2 with 1 million rounds and a 512-bit random master salt (1-4). The master key is stored locally in the config.xml file (see Common Settings and Storage Connection (config.xml)) – since the local machine is trusted, it is not encrypted. The master salt is stored in plaintext locally (although it is not needed) and on the offsite storage in the master file. Since the master salt must be public for when other clients connect to the repository, the master file is not encrypted. In the default configuration, Syncany uses one cipher. However, Syncany also supports nesting of ciphers. In this setup, the plaintext is encrypted with the first cipher, and every additional cipher is applied to the ciphertext of the previous cipher. This setup has relatively little research behind it, but we have decided to keep it for the more paranoid users. As of today, Syncany can theoretically nest any authenticated cipher that is supported by the Bouncy Castle Cryptography Provider, but only Twofish/GCM and AES/GCM (both 128-bit or 256-bit) are allowed by Syncany. If you are considering a nested cipher setup, we recommend first switching to 256-bit AES/GCM. 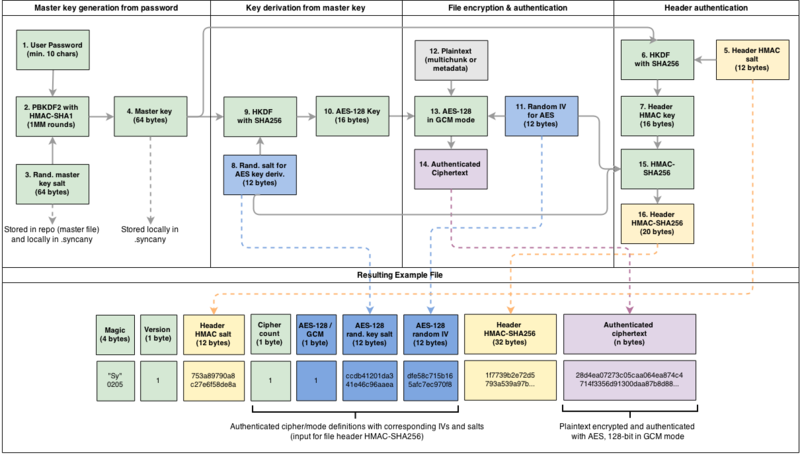 The diagram shows an example for the default configuration: For each file to be encrypted, Syncany uses HKDF with SHA-256 and a random 96-bit salt to derive a 128-bit file key to use for the AES cipher (8-10). In addition to that, a 128-bit random IV is created and used as input for the cipher (11). Using the 128-bit key and the 128-bit IV, Syncany then encrypts plaintext (= multichunk file, database file, etc.) using the AES cipher in GCM mode. To reduce improve encryption/decryption performance, Syncany re-uses file keys up to 100 times – meaning that up to 100 multichunks or database files are encrypted with the same key. Given that the maximum file size for multichunks is about 4 MB, max. 400 MB might be encrypted with the same key – although typically it’s much less. IVs are never re-used! The salts and IVs as well as the cipher configuration itself (here: AES/GCM) is stored in the file header of the crypto file format. Since this information is required to decrypt the files, they are unencrypted. However, to avoid an attack on the clients through header tampering, the header is authenticated using an HMAC with SHA-256, using a 128-bit header key derived from the master key and a random 96-bit header salt. Header HMAC: HMAC calculated over the cipher count and cipher specs. When a user connects to an existing repository using sy connect, Syncany first downloads the master file. This master file contains the unencrypted master salt which (in combination with the repository password) can be used to derive the master key. Using this master key and the salts and IVs contained in the encrypted database and multichunk files, Syncany can create the file keys and thereby decrypt any file. After the actual initialization, the sy init command creates a so-called syncany://-link which can be used by other users to connect to a repository. This link contains the plugin credentials needed to access the repository (e.g. FTP host/user/pass). The link is encrypted using the same crypto format as described above, except that the master salt is included and the link is base58 encoded. Encrypted links (normal): Links prefixed syncany://storage/1/ are encrypted and can be safely shared via unsecure channels. Plaintext links (not recommended! ): Links prefixed syncany://storage/1/not-encrypted/ are not encrypted and should never be shared via unsecure channels. Encrypted links are structured like this: syncany://storage/1/<master-salt>/<encrypted-config>. Both <master-salt> and <encrypted-config> are base58 encoded. The master salt is stored in plaintext and unauthenticated. The encrypted config is stored in the same file format as described above, i.e. using a nested cipher combination of AES and Twofish. When a client attempts to connect to a repository using sy connect syncany://storage/1/..., Syncany decrypts uses the master salt and the prompted password to derive a master key, and then uses the master key and the IVs and salts in the encrypted config to derive the actual cipher keys. These keys can then be used to decrypt the storage/connection config. Plaintext links naturally do not contain a master salt. They are structured like this: syncany://storage/1/not-encrypted/<plaintext-config>. The <plaintext-config> is simply a base58-encoded representation of the storage/connection config. Never share an unencrypted/plaintext link over unsecure channels, such as instant messengers or e-mail! If the link contains not-encrypted, it is trivial to retrieve the storage credentials from it. The Syncany daemon provides an API and a web interface that can be access over HTTPS (not HTTP!). The API is also available via secure WebSockets. The private key and the certificate are stored in a key/trust store. Using your own keypair and certificate is also possible. See Keys and Certificates for details. The user authentication and authorization capabilities of Syncany to the web server and REST/WS API are very limited. Syncany provides a simple HTTP Basic-based user authentication (but only over HTTPS!). All authenticated users have complete access to the REST/WS API. The user configuration is done via the daemon.xml file. See User Authentication (<users>). Syncany tries to prevent against a certain threat scenarios. This chapter briefly shows how an adversary might try to attack Syncany. In general, we differentiate between attacks on the data in transit and attacks on the storage provider’s side. Since the local machine is assumed to be secure and data we’re trying to protect is not encrypted on the local machine, attacks on the local machine are disregarded. An adversary with access to the network infrastructure, e.g. through network monitoring or a man-in-the-middle attack, can either passively monitor the network traffic or actively modify the data being transmitted. Since Syncany can be used with a many different plugins, the overall security of the solution strongly depends on the storage plugin. If, for instance, the FTP plugin is used, the transmitted data can be observed (or even modified) by the adversary, because the FTP protocol does not provide communication security. Similarly, if the WebDAV plugin is used with a HTTP target, the same attack scenario is possible. However, because Syncany encrypts files before upload, the data being transmitted is of little to no value to the adversary. Even if the data is changed by the adversary, Syncany will detect these changes, because only authenticated ciphers are used – meaning that data confidentiality and integrity is still ensured. When using a plugin without communication security and the adversary can modify the network, data availibility might be compromised. An attacker might simply read the storage access credentials and delete the entire repository. Syncany stores its data at a central storage. By definition, the provider of that storage has complete access to the data that resides on that storage. If an evil provider takes interest in that data, it is very easy to gain access to it. If, for instance, the owner on an FTP server decides to modify or delete your repository, it is very easy for them to do so. In fact, Syncany can never provide any protection against a provider-originated attack on data availibility. However, similarly to the above mentioned no-communication-security scenario, Syncany still provides data confidentiality and integrity, because files are encrypted in an authenticated mode before upload. A provider might be able to retrieve the encrypted files (or even delete them), but it won’t be able to decrypt them. One of Syncany’s assumptions is that users sharing a repository must trust each other completely. The reason for that is that to access a repository, credentials to the storage are shared. If one of the trusted users were to be tricked into giving up the password, or her laptop were to be compromised, the repository password, the master key or the offsite storage credentials might be in the hand of an attacker. If the repository password or the master key is retrieved, data confidentiality is completely breached – without other users having a chance of detecting it and without a chance of changing the password. Syncany can not prevent or detect if the master key or password has been stolen or was used by an adversary. If only the storage credentials are retrieved by an adversary, only the availability of data is at risk (same scenario as above). Listing available plugins: To list available remote plugins, Syncany queries the Syncany API (at api.syncany.org). Listing plugins is manually initiated via the command line (sy plugin list) or when opening the Preferences dialog in the GUI. Downloading/Installing plugins: When a plugin is installed via sy plugin install <plugin-id> (or via the GUI), Syncany retrieves the download location via the Syncany API, and then downloads this plugin from the that location (at get.syncany.org). Checking for application/updates: To check for new versions of the application and/or plugins, Syncany will query the Syncany API. This can be initiated via sy update check or via the GUI once a day. Pub/sub server: To quickly notify other clients that new data has been uploaded, Syncany subscribes each user to a small pub/sub server at notify.syncany.org:8080 based on Fanout. The data exchanged via this pub/sub server only contains the random repository identifer and is only used to trigger the other clients sync process. Short links: To shorten the syncany:// links (using the sy (init|genlink) --short option), Syncany will send the long link to the Syncany API and request a short link from there. The link will only be transferred with the --short option enabled. Please note that this will link (while heavily encrypted) contains your encrypted login credentials (see syncany:// Links). All calls to the Syncany API can be manually overridden by specifying an alternative API endpoint (--api-endpoint=...). The pub/sub server can be overridden by the --announce command line options or the corresponding configuration setting. All the cryptography related code is implemented in the org.syncany.crypto package. Feel free to inspect the code and create a new issue if something doesn’t feel right. In multiple peer reviews, it has been suggested to drop the cipher nesting in favor of a single cipher. While there is no evidence that a nested cipher is or might be weaker than a single cipher, there is very little literature about it – so it is probably not a good idea. See issue 59. As of today, neither the master key nor the password can be changed. See issue 150. The Syncany server is a rented server managed by the project lead of Syncany. It is located in Germany and hosted by Host Europe GmbH.